• Even if he doesn't see you, you can see him. Clip to vest or belt, or use magnet base. Stick the magnet base onto a car coupler for high-visibility warning that car is being worked. • Uses single “D” cell battery. Height 4.5" tall. Belt Clip and magnet base. • Xenon flash tube. 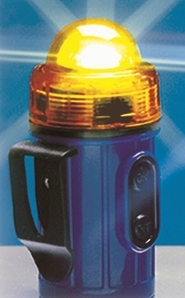 Blue light is also available with an LED bulb, which offers even greater brilliance and reduced battery drag.